Few things are more taboo to the global conservation community than whale hunting, but Japan doesn’t seem to care much. The country, frowned upon for its hunting of marine mammals like dolphins and whales, is doubling down on those endeavors with plans for a new, faster whaling mother ship to lead its fleet and better avoid activists who would try to stop them. In a clear sign of determination to continue annual whale hunts in Antarctic waters—often done under the guise of scientific research even though the meat from the kills is openly eaten—the country’s fisheries agency is looking into replacing or upgrading the 30-year-old Nisshin Maru, according to the Japanese to the Yomiuri Shimbun newspaper. It has also been widely reported that officials want a better ship in order to evade anti-whaling activists like Sea Shepherd, a group known for taking direct action against the whaling vessels. Japan halted its whaling program for two years in 2014, after the international court of justice (ICJ) ordered a temporary stop to the annual slaughter in the Southern Ocean. However, two years later it resumed the hunt, albeit with a whale quota diminished by one-third. In 2016, the fleet set out with a target of 333 minke whales and a final count of over 300. In December, the E.U. and 12 other nations condemned Japan’s Antarctic whaling program in a formal statement, however Japan has shown very little regard for such proclamations. In a statement Wednesday, Japan’s Prime Minister Shinzo Abe espoused his country’s intentions to pursue commercial whaling—whale war or not. 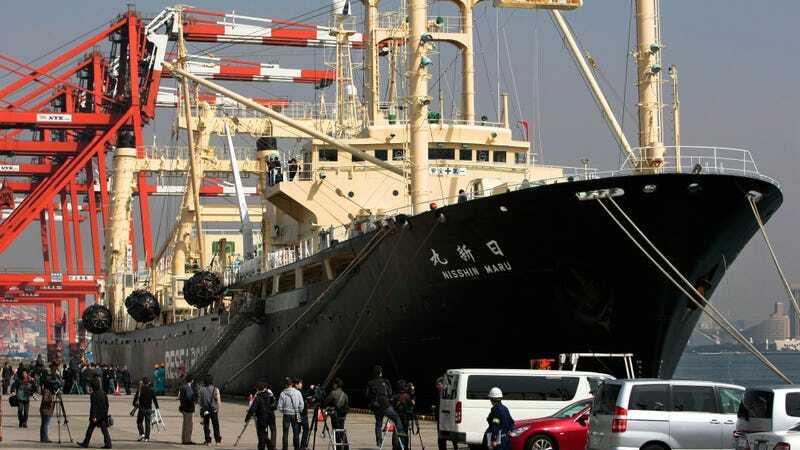 The IWC imposed a moratorium on commercial whaling in 1986, a year before the Nisshin Maru was built. Since then, Japan has slaughtered more than 10,000 whales according to the Australian government. Japanese whaling officials say it’s necessary to kill whales to study their behavior and biology—including determining age and reproductive status—but many environmentalists and scientists disagree. In what seems like an oddly timed coincidence, on Wednesday the Japanese town of Taiji, infamous for its whale and dolphin hunts, announced a new sister-city relationship Klaksvik, a Faroe Islands town that has also been targeted by activists for its whale hunting practices. The mayors intend to meet soon and discuss whale killing.